I confess, I am like most artists. I hoard things, I move found objects from home to home. In high hopes it will get used. I mean WILL. BUT I DID use it, and I think it fits perfect, thank you very much. This is about my obsession with green olives. Since I was young I have loved olives. Olives of every kind. yum. But especially green ones. I found this old storm window in the basement of the 2nd house I lived in on campus. 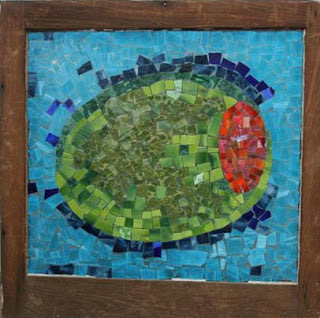 I used stained glass from Franklin Art Glass left from some other projects my friend Lisa and I worked on. (yes more saved stuff, sorry) The glass is glued directly onto the window, creating that stained glass look, without the leading. If all goes well you might be able to check this one out on OSU campus next month! I will keep you posted!